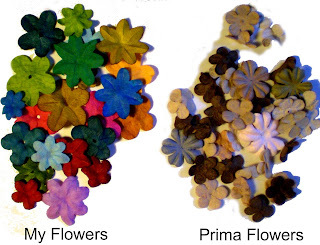 I am using my Cricut machine to make Prima style flowers using cone shaped coffee filters and coloring them w/ various inks. They cut very flat, and then I add dimension by scoring and embossing them by hand. A good way to get just the right color flower for a project. Click here to download a tutorial PDF. What a resourceful idea! I have tons of Prima's, but, I swear, I *never* have the right color, so I am always coloring a white/off-white one. Thank you!!! Thanks for the cut file! I made some befor with punches, then I scord them on a foam mat and I punched my scoring stylus through the senter to add more dimention. I never thought about the coffee filters though and I have many since I make books with them. PS welcome to the SCAL user group! Saundra...This is the very best idea! I'd have never thought of it but I'm sure glad you did! Thanks so much for sharing...now I'm off to make some for myself with your awesome instructions. YEA!!! Thank you so much for this Freebie. I want to let you know that I posted a link to your blog in Creative Busy Hands Cricut Freebies Search List, under the Garden Theme post on May. 18, 2009. Thanks again.